Product: Replacement Spalding Basketball Hoop Customizable E79XXXNCAA HUFFY NCAA 44 Basketball Backboard & Rim Combo. 44x30 Composite framed acrylic backboard. Huffy Backboards and Rims include a white all-weather net. 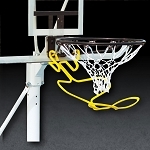 Huffy Basketball Backboards can be mounted using universal mounting bracket #8406 Huffy universal mount or extension arm pole system #8800. Generally ships out within 24 business hours of ordering. Ships via FedEx, no signature required. What do we think about this backboard and rim E79XXXNCAA? If you are looking for a replacement backboard for an existing Huffy goal and your backboard is either 44" or says Premier 700 series then this is what you are looking for. If your existing system is a different brand, then this will not be compatible. 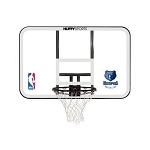 This hoop and rim are great for use as a replacement backboard or for first time use. They are very durable and will afford many years of basketball play. The board is acrylic which is designed to simulate glass. If you are purchasing this for first time use you will need brackets to mount it to a wall, roof, or pole. The brackets that are compatible with this model are: 8839S and 8406S. What do our eBay customers think about this product? hheroldt Arrived very timely, exactly as advertised, thanks! Q: Hello: Can I have my grandson name put on backboard? Is it still out of stock for Michigan? A: I'm sorry, but we do not customize those with personal names. I'm sorry for the bad news. It is out of stock for Michigan. Feel free to contact us with any other questions. Dimensions: 45" x 31" x 6"